The Rye Fire Department provides tours for local churches, schools, and other groups. Firefighters teach children about fire safety and instruction in what to do in the event of a fire. If you would like to schedule a tour for your organization or group, call the Rye Fire Department at (603) 964-6411. Our fire prevention division is waiting to assist you. In 2010, there were 1,331,500 fires reported in the United States. These fires caused 3,120 civilian deaths, 17,720 civilian injuries, and $11.6 billion in property damage. A fire department responded to a fire every 24 seconds. One structure fire was reported every 65 seconds. One home structure fire was reported every 85 seconds. One civilian fire injury was reported every 30 minutes. One civilian fire death occurred every 2 hours and 49 minutes. One outside fire was reported every 50 seconds.· One vehicle fire was reported every 146 seconds. In the hall near every sleeping area. If your home has multiple sleeping areas, install a unit in each. If a hall is more than 40 feet long, install a unit at each end. At the top of the first to second floor stairway. Make sure no door or other obstruction could keep smoke from reaching the unit. At the bottom of the basement stairway. Make sure no door or other obstruction could keep smoke from reaching the unit. Where combustion particles are produced. Areas to avoid include poorly ventilated kitchens, garages, and furnace rooms. Keep units at least 20 ft from the sources of combustion particles if possible. In air streams near kitchens. It is possible normal air currents can draw cooking smoke into the sensing chambers of a unit near the kitchen. If you experience frequent unwanted alarms from a detector near your kitchen, relocate it. Do not remove the battery! In very damp, humid or steamy areas. Where the temperatures are regularly below 40°F (40°C) or above 100°F (38°C). In very dusty, dirty, or greasy areas. Clean a laundry room detector frequently to keep it free of dust or lint. Near fresh air vents, ceiling fans, or in very drafty areas. Assistance is available from your firefighters of the Rye Fire Department. We can assist you in proper placement of smoke detectors. 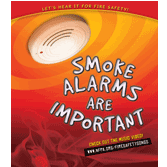 Install at least one smoke detector on every level of your home and in every bedroom. Keep detectors clean, and test them weekly. Replace smoke detectors immediately if they are not working properly. Smoke detectors that do not work cannot alert you to a fire. Develop a family escape plan and practice it with everyone in your family, including small children. Draw a floor plan of your home and identify at least two exits from each room and one way to get out of each bedroom without opening the door. Decide on a meeting place a safe distance from home and make sure everyone knows to wait there. Make sure everyone, including all children, knows what the alarm signal means and how to react to it. Teach them they must be prepared to leave the home if needed. Hold fire drills every six months and practice how to escape safely. Show children how to check if doors are hot before opening them. Show them how to use an alternate exit if a door is hot and shouldn't be opened. Teach them to stay close to the floor and crawl if necessary. Keep at least one working fire extinguisher on every floor, and an additional one in the kitchen. Have fire escape ladders or other reliable means of escape from and upper floor in case the stairs are blocked. Use smoking materials properly. Never smoke in bed. Keep matches or lighters away from children. Store flammable materials in proper containers. Keep electrical appliances in good condition and don't overload electrical circuits. Keep stoves, barbecue grills, fireplaces and chimneys free from grease and debris. Never leave anything burning in fireplaces and keep chimneys free from creosote and debris. Never leave anything cooking on the stove unattended. Don't allow rubbish to accumulate. Always have any heating appliances inspected by a licensed professional annually.